Virginia State Police cleared Emancipation Park Saturday after a white nationalist demonstration turned violent, but the action forced attendees into a crowd of counter-protesters. The rally was organized as a protest to the ordered removal of a statue of Robert E. Lee in downtown Charlottesville, Va. The rally was named the “Unite the Right” rally, but attendees largely identified as white nationalists or white supremacists when asked by reporters on the ground. Both Black Lives Matter and then antifa declared they would bring members to Charlottesville to protest the rally, setting up a showdown between the two groups. 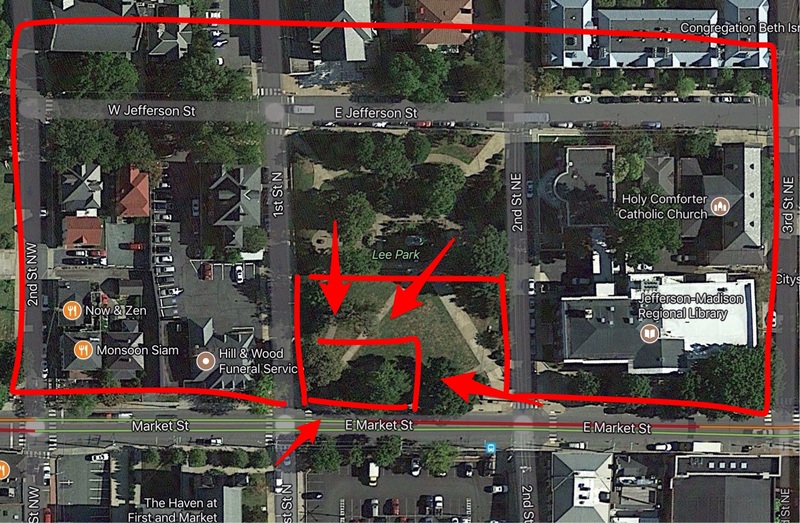 The white nationalists applied for a permit from City Hall, and originally obtained a permit for McIntire Park, a location roughly a mile and a half away from the statue. But white supremacist Richard Spencer declared that the group would meet at the much smaller Emancipation Park, the home of the famed Lee statue. City Hall approved the permit Friday evening. Protesters on both sides roundly criticized police behavior, but police officials say they did the best with the resources they were given. The Daily Caller News Foundation provides an exclusive look into what steps the police took in their effort to clear the park, based on accounts from reporters on the ground. The call for police assistance echoed through the streets until police took control of the downtown area after a car slammed into a group of protestors Saturday afternoon. Several protesters cited the lack of a police presence as they tried to get help for their injured. The police initially offered to keep the rally attendees and the protesters separated. The department provided a line of police support at the southern edge of the park. Both Charlottesville Police (CPD) and Virginia State Police were present on the scene Saturday morning, but CPD maintained control of the scene until Gov. Terry McAuliffe declared a state of emergency. The state police took control of the scene and pushed rally attendees and protesters together on East Main Street. Police then stood back, only stepping in to intervene after a white supremacist ran a Dodge Challenger through a crowd of protesters. The American Civil Liberties Union (ACLU) initially reported that members of the local police department were ordered to stand down and not engage with members of either the rally or protest in any way, according to the ACLU’s paid observers. Charlottesville Police Chief Al Thomas quickly refuted that report during a press conference Monday afternoon. He said that members of the police force pulled back because Gov. McAuliffe declared a state of emergency in order to change into protective riot gear. He also argued that limited resources resulted in the stretched law enforcement, according to the New York Post. McAuliffe originally asserted during a Sunday interview that the police didn’t come between the protesters and members of the alt-right protest because of the existence of the militia during an interview with The New York Times. Thomas asserted those claims were false during the Monday press conference. The police force on-site originally consisted of local officers who cordoned off the northern access to the park. 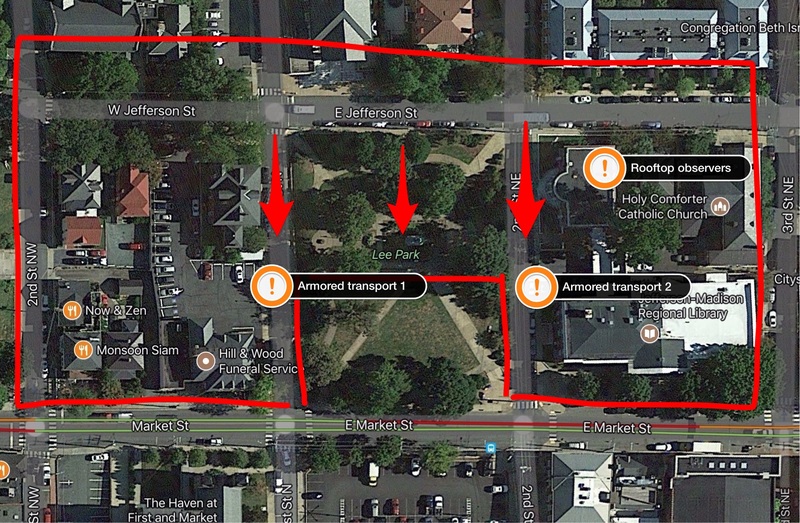 Thomas reported that the force offered rally attendees a protected entrance into the park from the north, something that he says alt-right organizers refused to do. The red lines in the photo above illustrate the area blocked off my local and state police. 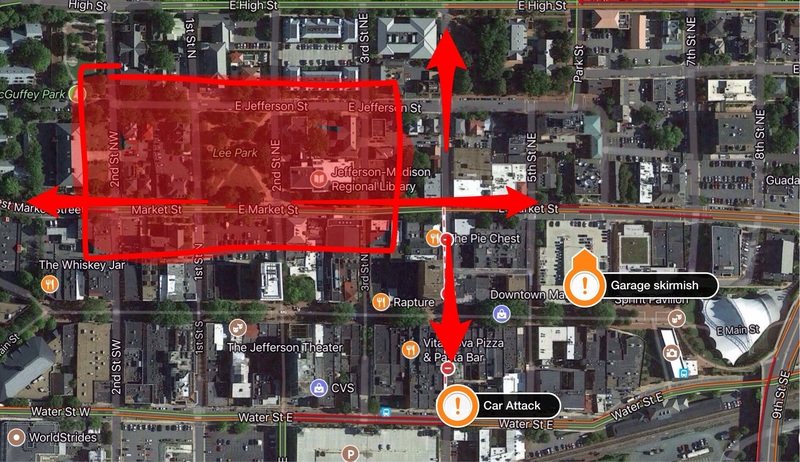 The white arrow shows the route taken by members of the alt-right, and the yellow arrow shows the path taken by a majority of the antifa and Black Lives Matter protesters toward the event. Members of law enforcement blocked off the north, east, and west entrances of the park, leaving only the south entrance open. Members of state police occupied a line through the middle of the park to ensure that there was a barrier between the alt-right rally in the park and the antifa and Black Lives Matters protesters on East Market Street. Attendees entered the park from the westward stair of Emancipation Park starting at about 8 a.m. until the initial conflict began around 10 a.m.
Daily Caller News Foundation reporters on the scene were forced to walk from several blocks away to the north due to the roads that local police closed in anticipation of the event. Members of the local police department stopped from checking their phones to point the reporters in the general direction of the rally. The rally was four blocks out of the way to East Market Street, where a crowd of protester gathered front of the park on the South side. There were three lines standing between the protesters and the white supremacists in the park. The first was a line of state police in normal uniforms. There was also a line of heavily armed militiamen who carried semi-automatic rifles, as well as pistols. Finally, a line of “faith leaders” held themselves arm in arm to provide an additional barrier. Groups of white supremacists began to march in from the East, and they were pelted with water balloons, glitter bombs, and spit. The stench of urine filled the air as more and more protesters joined the crowd at the front of the park. Some protesters tried to push their way past into the entrance of the park but were stopped by a small group of “enforcers” donning handmade shields and batons to contain the protesting groups to the street. TheDCNF reporters worked our way through the crowd towards the park, where members of the protests began yelling at us and pointing their middle fingers toward the camera. Occasionally, a protester would scream at us, but then quickly cover their face when the camera moved to them. The police maintained their distance through all of this. Eventually, we made our way to the entrance of the park but were turned away. Members of the white supremacist groups told us no press was allowed. Shortly before 10 a.m. we noticed protesters making way for a new group marching from the east. We ran over to discover that the new group was a battalion of antifa members from all across the country. Protesters began testing the limits of the civilian barriers. The “faith leaders” were the first to go as they silently fell back towards the down town mall, but the militia and the state police stayed in place for the time being. Members of both groups threw filled water bottles at each other. Often, the targeted group would return fire by throwing the water bottles back. It wasn’t long before protesters fell back to the other stairs to focus on the eastern entrance of the park. We made our way to the heart of the action, where we saw individual protesters throw themselves against the white supremacist shield line. Police remained on the other side of the park as protesters slammed themselves against the alt-right shield line. Both sides eventually advanced on the other, and we were again caught in the crossfire. Several bottles hit us, and members of both sides began swinging wooden stakes and batons at each other all around us. Police remained still on the scene. Protesters then brought out a “battering ram” made out of plywood and reinforced with a metal step ladder. Members of the protest charged at the white supremacists, knocking us down in the process. Enforcers managed to stop the device before it reached the actual shield line, but a new group of protesters tried to push the ram further. The force of both groups was enough to tear the metal ladder and break the device in two. We looked up and noticed that the militia and members of the police had both retreated to behind Emancipation park, meaning that there was no one between the alt-right demonstrators and the protesters. I looked in the distance to the northern part of the park and noticed that police in full riot gear were gathering, and I noticed two armored transports were working their way into position, a line of police officers filed in behind the transports. White supremacists began using pepper spray on the protesters. The cloud of chemicals hung in the air after the crowd had dispersed and clung to our skin and clothing. Our eyes, arms, and throats began burning, and we fell back out of the cloud. It didn’t take long for members of both sides to rejoin the fight. Protesters used makeshift tear gas and smoke bombs to force the white supremacists back into the park, and a lone member drew his pistol and leveled it at the protesters marching up the stairs. He eventually turned tail and rejoined his comrades. Protesters didn’t appear to notice in the action. We were streaming live when an Associated Press notification popped up on my phone alerting us that McAuliffe formally declared a state of emergency this was shortly before noon. Then the armored troop transports moved up on either side of the park. State police removed metal barriers that kept white supremacists from the statue and began moving forward in a single line, with each officer standing shoulder to shoulder with the other, carrying shields. A member of the police force announced over a bullhorn that the park was officially closed, but hardly anyone could make out the words. The police then began marching south across the park. Members of the alt-right groups were attacked from the north by state police. Members of antifa and Black Lives Matter came in from the south and the east. The moving police line pushed members of the rally into the street, but a small contingent of rally attendees pushed against the police line. We were in the middle of the park, when a line of protesters advanced up the southeastern stairs and met the white supremacists and began tackling them to the ground. The lines finally broke as members of the rally began engaging directly with the police and with the protesters that were now flooding the park. We were surrounded by all sides by groups of people hitting each other with signs, fists, shields, or anything else that was available. Police grabbed anyone in their way as they marched down the park. White supremacists and protesters were arrested and detained, although only a small number of individuals were actually charged with any crime. Eventually, police cleared the park, and members of both sides of the conflict continued their fight in the street as they made their way down both directions of East Market Street. Members of the multi-state militia fell back to behind the police line as chaos erupted on the street. The police stayed in the park to ensure that no one attempted to regain the public space, but protesters spit on and continued to harass the white supremacists as they maintained a line through the street. Several skirmishes broke out and members of the rally attacked protesters with sticks. Some members were tackled to the ground, and several members of both sides sustained heavy injuries such as severe blows to the head and broken ribs and arms. One member of Antifa retreated to the front steps of the local NBC affiliate downtown after he sustained a heavy blow to the head. His legs and arms began shaking as other members of Antifa demanded emergency response. We trailed a group that marched to the east towards a local parking garage. Several members of Antifa trailed the group as they marched. Several white supremacists tackled a protester to the ground and beat him in a particularly bad fight, chipping his tooth and breaking several bones. A local police officer charged out of the nearby police headquarters with a hand-held Taser, pushing past me as he broke up the fight. We were in a local restaurant reporting to our colleague what took place when he heard screams and saw people running down the street. We began recording and ran down the street to find chaos. Injured victims were everywhere, protesters rushed from victim to victim trying to help whoever needed it. They attacked us for recording the scene, with several members of the group attempting to steal the camera, others punched us as we worked to retrieve the cameras and resume our way towards the scene of the crash on the corner. People everywhere were calling for police and paramedics, but the protesters themselves were the only ones on the scene at the time. State Police officers came down the street and attempted to establish order, but ambulances were trying to make their way through the crowd. Eventually, paramedics had to carry in stretchers to assist the most injured in the group. State Police in full riot gear took control of the scene of the attack within minutes after the care attack. Police used shields to block off protesters from clogging the streets while the ambulances were loaded. They then pushed everyone out of the intersection so the area could be designated a protected crime scene. Police waited until the car attack occurred to intervene in any of the violence after they ejected rally attendees from the park. Several protesters and white supremacists were injured in the fighting on East Market Street before that decision was made. The police decided to stay behind and secure the park, essentially leaving the already violent protesters and alt-right rally attendees to fight amongst themselves as they made their way from the downtown area. There was a thin line of police between the two groups, but those police officers were called back once the governor ordered a state of emergency. As a result of the decision to not maintain stricter control of the situation, one was killed and 19 protesters were injured during the car attack, and an additional 35 people sustained serious injuries in the violence immediately after the park was cleared by state police.